choose the experience D&D Painting offers. 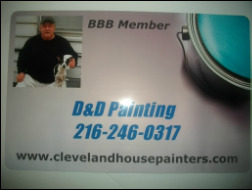 Proudly Painting Cleveland Homes for over 35 years! Get Ready for "Spring" and the BEST Rates! SAVE MONEY... CALL Today for Best Rates! ​Design Consultation and Free Estimate! We serve the following areas, Avon, Bay Village, Beachwood, Bedford, Berea, Brecksville, Brooklyn, Brookpark, Cleveland, Cleveland Heights, Eastlake, Euclid, Garfield Heights, Independence, Lakewood, Middleburgh Heights, Northfield, North Olmsted, Parma, Rocky River, Seven Hills, Shaker Heights, Strongsville, University Heights, Valley View, Westlake, Wickliffe, Willoughby, and more! * We specialize in both interior and exterior residential, commercial, and industrial painting projects. * Our crew of painters provides the highest quality painting service , professional preparation and application at most competitive price. ~~~ Whether looking to renew your home with a fresh coat of interior/exterior paint or do a small bathroom remodel you can be certain that our staff will provide you with an individual attention because your satisfaction is most important to us. Our Belief – D&D Painting has the highest standards of quality and service in the residential painting and commercial painting industry, focusing on professional workmanship. View our Testimonials page to view our customers complements. Happy New Year 2019 --> From Our Family to Yours! Call for Details & a Free in Home Estimate Today! "HOT" Savings Going on NOW! Painting Contractor : House Painter, Quality Painters Services! ﻿ Are you having problems with rotting trim or siding of your home? No problem, our repair specialist can handle it. When you request a free estimate our estimator will inspect your home for rotting wood. Save your homes foundation, our services include﻿ Gutter Cleaning. Preparing the painting surface often takes more time than the painting itself does; in fact, interior paint preparation can sometimes make up 75% of the project! We are making sure your walls are well prepared for new paint. Power Washing/Pressure Washing - caulking - priming - spraying - rolling - interior and exterior painting - deck & porch staining/cleaning, Gutter Cleaning, cabinet installs, wallpaper, and more. ~ No Hidden Fees, no surprise charges. ~ Upfront in home/business Estimates and Pricing. 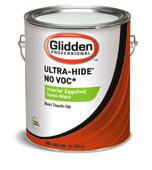 ~ Full service painter, qualified professional painters. Industrial & Commercial Painting jobs, inside and out! Previous clients include: the Cleveland Ohio Catholic Diocese Churches and Schools, Walgreens, Regus Business Offices & Conference Centers. Does your House need a expert makeover? Over 35 years Painting Experience! Our house painters pride themselves on paying attention to all the details when working in your home. Only top quality products and workmanship will be delivered, that is a promise! Your Cleveland house painters (D&D Painting) are the most experienced, courteous, and dependable house painters available. "From start to finish, our customers are impressed with the results a professional painting contractor with their home looking even better than if it were new. 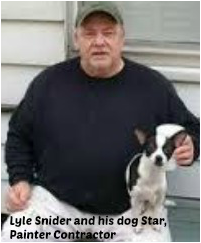 You will find professional residential painters get the job done right the first time, every time." a sight to see, the color of life! Call Us Today for a Meet & Greet "Free Estimate." Put Down the Brush, Call the Cleveland House Painters Today! 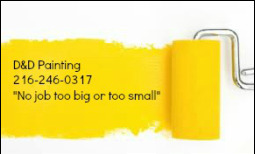 "Painting Houses One Color at a Time"
Please Note: Special Discounts to Seniors, and our American Veterans.